Over the weekend we said goodbye to our rooster-hen. I'd like to say that the parting was bitter sweet but that would probably be sugar coating it. I was happy to see her go. I pretty much let N8tr0n load her into a crate and never looked back. Her crowing drove me up the wall and after she pecked me (like not hard enough to break the skin but hard enough to break my heart) ((except my heart wasn't broken so much as it was completely pissed off)) well, let's just say we weren't the best of friends having so much fun together. Anyway, we loaded her up and sent her off to the ranch. And no, not the kind of ranch you're thinking of. An actual ranch where my cousins live. And speaking of cousins, mine were kind enough to trade us straight up for one of their hens! Isn't that great? Now I can still have four chickens AND not get woken up at 5:00 AM by rooster-hen! Allow me to introduce you to Lilly II. 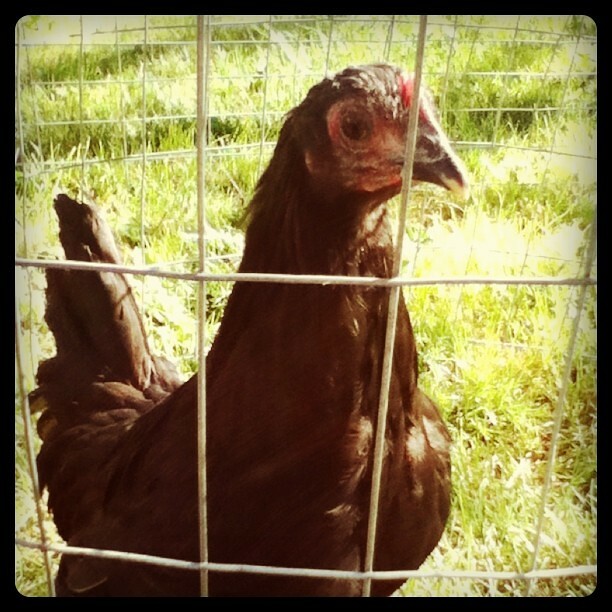 She is an Australorp and as far as we can tell, very quiet. Very non-rooster-ish. We hope she likes it here. Lilly II is currently being quarantined on the other side of the yard. The experts recommend quarantining for at least 30 days but uhhh, we're not going to be doing that. In an effort to balance prudence and practicality we'll probably quarantine for a couple of days and then introduce her to the ladies. I'll let you know how that goes since introducing a new hen means they have to revamp the pecking order and all that jazz. Unless the results are gruesome. Which I'm sure they won't be. But, you know, if they are I won't tell you about it. So, farewell Rooster-Hen. I would say that we'll miss you but right now I'm looking at the scab on my hand from when you bit me so...have a nice life. I'm Hilary's mom. Hilary usually sends me your posts on chickens. She says I need chicken friends. My kids are a little sick of me talking about my chickens needless to say. Just thought i would share our experience with adding a new chicken. We had two 12 week olds and I wanted to add an egg layer so we got a two year old RIR chicken. Quarantined her for a day where the other chickens could see her then added her to the coop. She was pretty mean at first and we were so worried but just kept a watch on them. It took about two weeks (she is now at the top of the pecking order and the little ones don't seem to mind) but now they all can hang out together with no pecking. Good luck. It was stressful at times. Yeah, shes goofy looking. Adolescence isn't kind to anyone, foul included. Ha! made me laugh so hard I cried. Can hardly wait to see you.